In my first Keto post I talked about switching over to a ketogenic or Keto Lifestyle and talked about what it was. It is a diet low in carbs, adequate protein and high in fats. Being in the state of ketosis feels amazing! This occurs when the body is metabolizing fat at a high rate and converting fatty acids into ketones. You have boosted energy, feel more focused and like a new person. Once you’ve experienced it you can tell when you’re no longer in it. Taking on this new lifestyle has been challenging. To remain in ketosis it requires less sugar intake which has been my downfall. There are long periods when I’m focused on eating smart and cutting back from my regular junk food consumption. Then those where in between I loose sight, give in and fall back into my old ways. 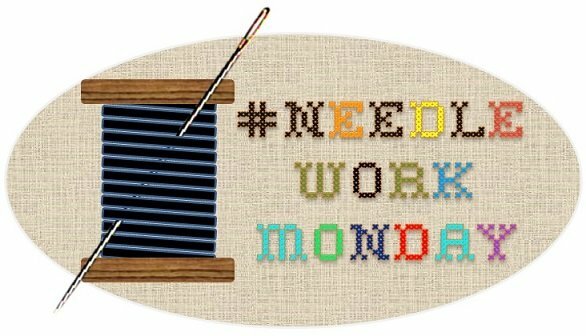 It leaves me feeling sluggish, drowsy, not as focused and just blah. I can literally tell when I’m not in ketosis anymore. The good thing about a Keto lifestyle is that you can jump right back in. You can quickly get back on track if you stay focused and clear of too many carbs and sugars. I believe it will get easier as we go. It may take some time for it to stick and for me to be strong to resist what I’m used to consuming. I purchased more Keto staples to have on hand. Swerve is the sweetener we use now in place of sugar. It had some really good reviews and quite a few people said it tastes the closes to sugar compared to other ones. It actually does! It’s not bad at all. It’s a blend of non-GMO ingredients that are derived from fruits and vegetables. It contains no artificial ingredients, preservatives or flavors. Oh and it’s zero calories too! I also purchased grass fed butter which is higher in Vitamin K2 and Omega-3 fatty acids, nutrients that are incredibly important for the heart! It tastes yummy too! I love the idea of eating butter that came from the natural way of nature...from cows that eat grass instead of grain-based feeds with soy and corn. Grass fed butter is filled with many more nutrients. Being more conscious of the foods we intake and what’s in those foods is so important. For years we have been told that fat free is the healthiest but little did we know that while the fat was being taken out the sugar levels were being hiked up. Fat free = tons of sugar! No wonder so many of us are hooked on sugar. I’ve been using cabbage as a replacement for noodles and it works! I actually prefer cabbage noodles over pasta noodles. This was a chicken and cabbage soup I made. 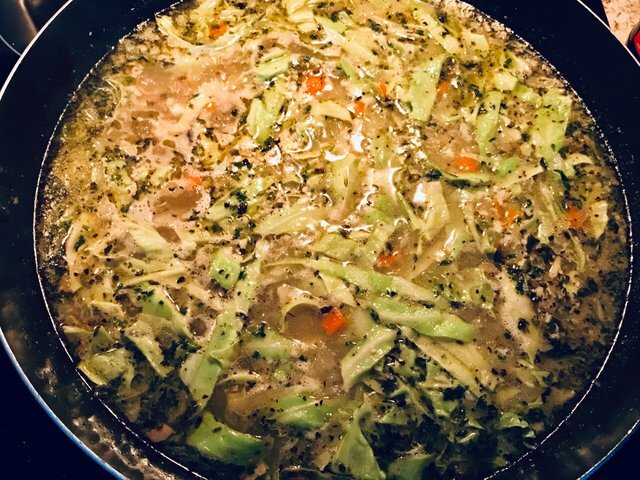 I didn’t get a picture of the finished soup after the cabbage became transparent but you can still see here that it’s loaded with veggies and herbs. 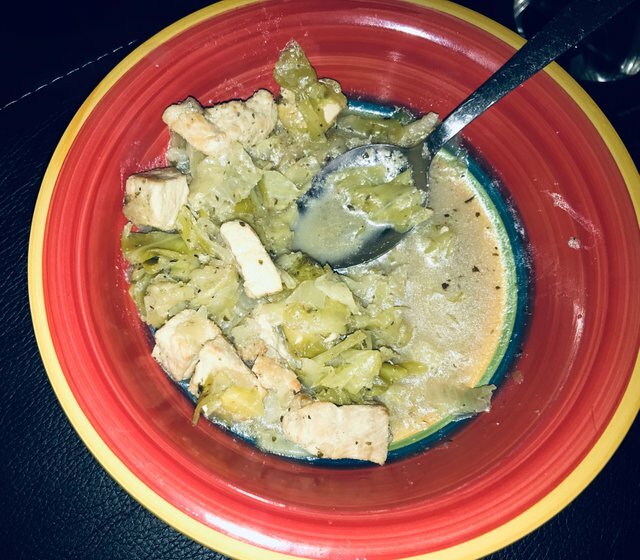 My family, including my kids loves this soup and prefers I keep making it with cabbage. Overall I am really enjoying this new lifestyle. It’s fun learning more about it and purchasing new staples to cook with. With my busy days and very active children having more energy is a must to keep up around here. I am still exercising during the week as well. Oh yes, definitely going to let @roselifecoach know about cooking with cabbage! Thanks for sharing your journey! I love your pictures!!!! You are so talented @crosheille :) I'm glad you are having such success with your keto program. We have certainly embraced the lower carb lifestyle in general. I love keto fathead dough which I have shared. Keep at it girl! Ha ha thanks so much!! I’ve gotta work on my food ones lol! I really love it, I feel so much better when I’m on track. Oh my goodness I just made a pizza using the fathead dough!! It’s soooo darn delicious!!!! Nothing wrong with your food photography @crosheille, cabbage has almost become hubby's new staple food! He's doing so well on Keto. What did you put in the cabbage soup, it looks delicious! 😄 Thanks @lizelle! That’s so great to hear!! I’m glad it’s going well for him! Thank you @crosheille, definitely trying your soup! I am also a lover of grass fed butter. I use it as an ingredient to make homemade grass fed ghee. Wherever I used to use grass fed butter, now I use homemade grass fed ghee. There are many online tutorial videos that teach how. It basically requires simmering the grass fed butter (it has to be the kind that does not contain salt) on a very low heat, and then scoping out the foam that is produced from that heat. Then, it requires being covered and left to cool on the stove. After it has cooled, it is poured it into a glass container and then placed in the refrigerator. Grass fed ghee can also be infused with medicinal herbs. In India, it is considered a sacred food. Wow oh wow! This is very interesting! It’s funny you bring up ghee because I just purchased my first jar to try out. I love the way it melts and toasts our grilled sandwiches. This is the first I’ve heard of someone making it at home! LOVE cabbage! Looking forward to winter stew time. Zucchini noodles are also an awesome alternative, especially with a sauce like bolagnaise..
Isn’t it awesome!! I could eat it all week like seriously! Ah yes!! I found a recipe last week I wanted to try that calls for zucchini noodles! I’m glad you confirmed they are awesome!! I’ll be making that one soon! 👌🏽 Thank you! To take these lifestyles you have to have a lot of willpower !! I congratulate you for trying. I think I could not. A lot of strength and luck !! Regards!! Yes @lasocia you definitely have to have the will power. It definitely is challenging but doable! Especially because with the Keto Lifestyle you can still eat really good food...desserts included. Kerrygold is life! Seriously, their butter is the BEST! Glad your diet is working out well! Sounds fantastic! I almost went for the Stevia until I heard about this one. I purchased the granulated and it really is very similar to regular sugar. I think you’d like it if you gave it a try!! Lol!! Yes I must say I am loving this butter! Not sure where it’s been all my life ha ha!! Yesss Ill have to try it! Stevia is good, but leaves something to be desired. I usually end up adding a little cane sugar just to make it taste more 'right'. I agree about Stevia. We are trying those sodas called Zevia made with Stevia. They definitely have an after taste to get used to. Neat! Ive never heard of them... I can imagine the aftertaste though, LOL! Oh my goodness.. that cabbage and chicken soup looks SO good!! I can tell it is delicious! 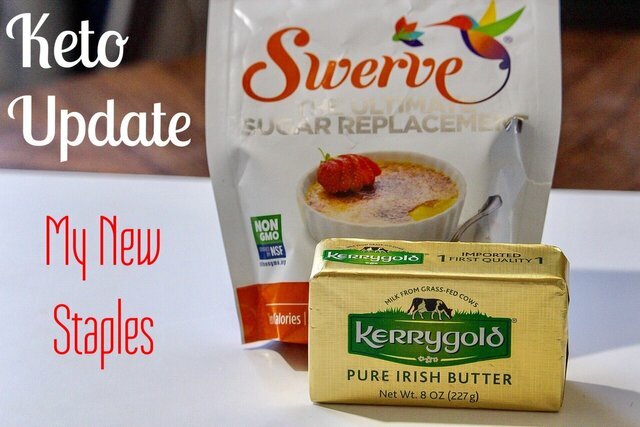 I love kerrygold butter.. i have eaten it for a few years and didnt know how spoiled I was with it until last winter I made my own butter with cream from a local pastured, mob grazed dairy and I honestly could not tell the difference! We need more local grass fed butter makers!! Thank you @sagescrub!! There wasn’t enough leftover for the next day. My kids really love this soup which really surprised me. Wow that sounds awesome!!! I definitely agree that we need more local grass fed butter makers!! I really love the taste of it!!! I’m glad I purchased a good brand. It’s good to know others love it too!